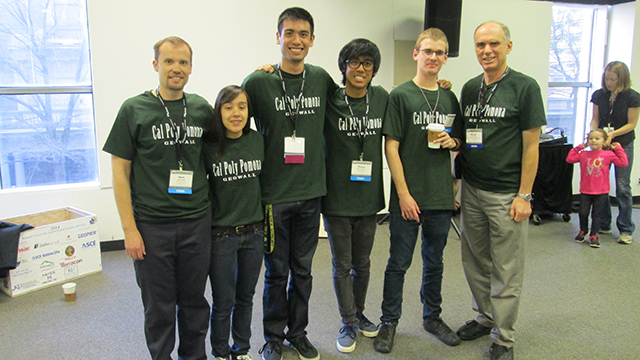 A Cal Poly Pomona civil engineering team placed second out of 16 schools in this year’s GeoWall national competition. Cal Poly Pomona’s civil engineering GeoWall team has placed second out of 16 schools in this year’s GeoWall national competition, beating out teams from UCLA and Cal Poly San Luis Obispo. The competition, which was held in Atlanta, Ga., on Feb. 24, is the third in a row where Cal Poly Pomona’s GeoWall team has placed in the top three. The team placed first the previous two years. Teams were tasked with building an earthen wall designed to contain hundreds of pounds of sand. The teams’ designs are tested with ever increasing weight loads. This type of structure is often utilized under highway overpasses and is recognizable by their checkerboard design, according to Alex Wells, design lead for Cal Poly Pomona’s GeoWall team.